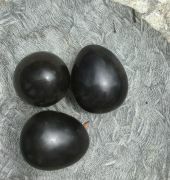 Surveyors – cast bronze wedge- tail eagle eggs in dolerite boulder nest. The Three Capes Track is a coastal walking track operated by Tasmania’s Parks and Wildlife Service. It is a four day walk in south-east Tasmania and takes in Cape Pillar and Cape Hauy on the Tasman Peninsula. There are only 48 walkers per day with accommodation provided in three deluxe huts along the 46-kilometre route. 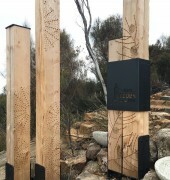 The track also is the home to five fantastic public artworks by Tasmanian artist Alex Miles that were developed through the Tasmanian Government Art Site Scheme. The artworks are located at key sites along the track and Alex has also designed signage and bespoke fabric for the deckchairs at the huts. The series of artworks celebrate the ecology, geology, history and cultural attributes of the area. The works are located at the beginning and end of the walk and at each overnight hut. 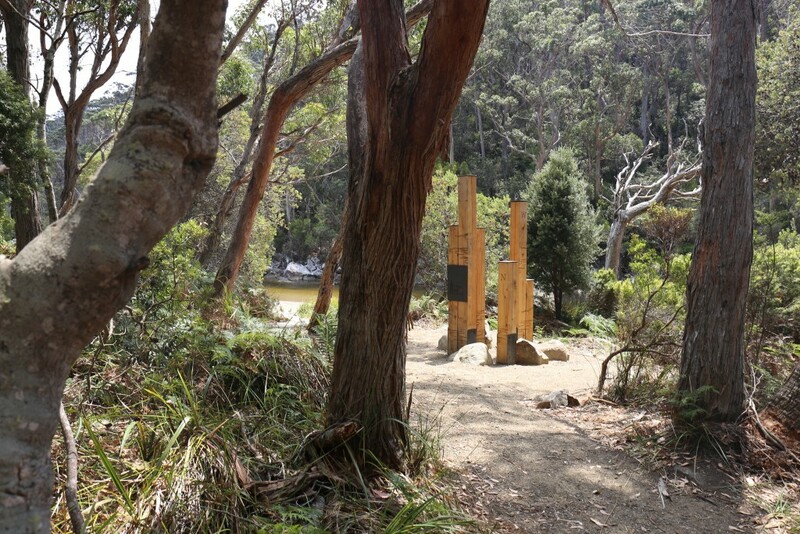 Much like the cairns that guide walkers on their way, these artworks act as sculptural beacons, reflect elements found in the environment and act as a counterpoint to the grand views experienced by walkers on the track. 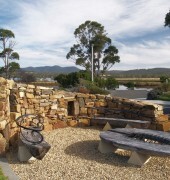 Denmans Cove – a cluster of large, locally sourced boulders at the base of six routed timber posts. 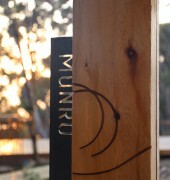 The posts incorporate elements of pattern that reference highlights on the track – eagles, cliffs and banksia. This work is designed to create a sense of anticipation for the days ahead and is a place to find your bearings. 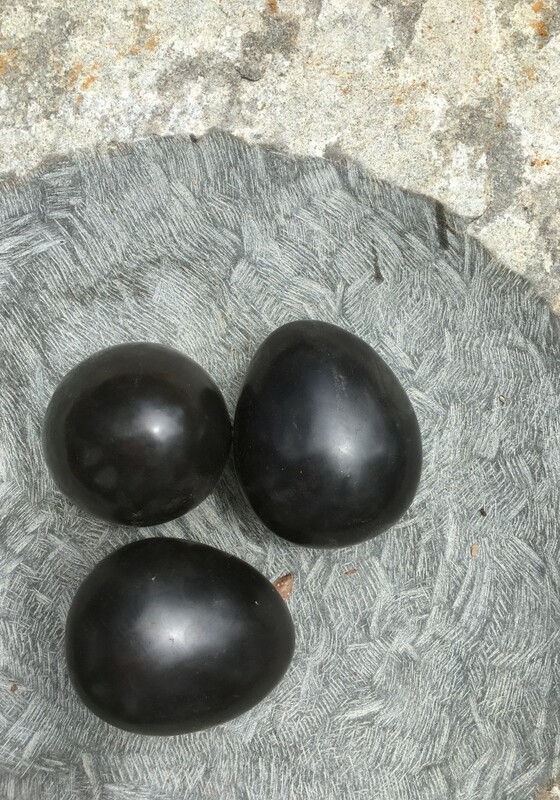 Surveyors – this work is conceived as a celebration of the small treasures to be found on the walk, such as the tiny native orchids and fragile eagle nest sites that were all considered and mapped in the creation of the track. 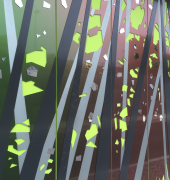 The work references the flora, fauna and geography of the site with specific reference to the eagles, tapered leek orchids and topographic notations. The work includes a carved dolerite boulder forming a nest for three cast bronze eggs that are double the size of an actual wedge-tail eagle’s egg. Munro – with dramatic views to the sea, Hippolyte Rocks and Cape Hauy in the distance, this work references life, death, constants, change and the fury of the sea. 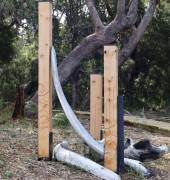 It includes a group of timber posts surrounded by whale bones and large driftwood logs. 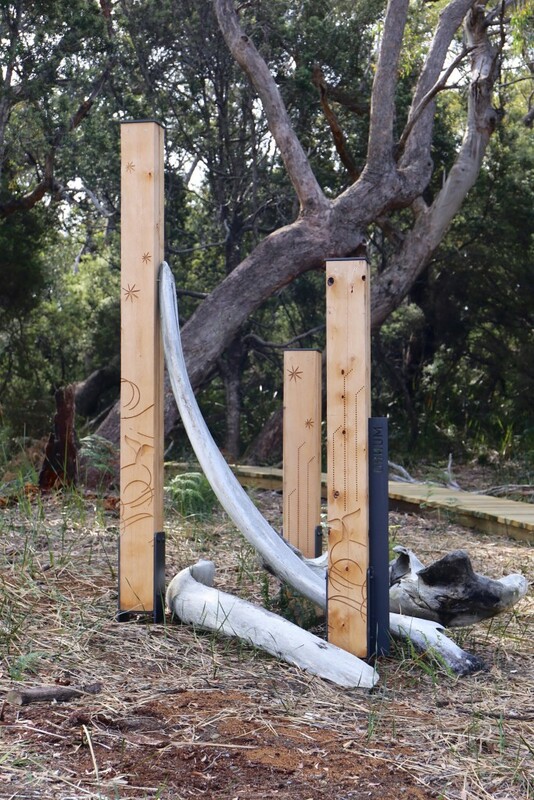 The timber posts reference the dolerite columns, the driftwood and whale bones reference life and death at sea. 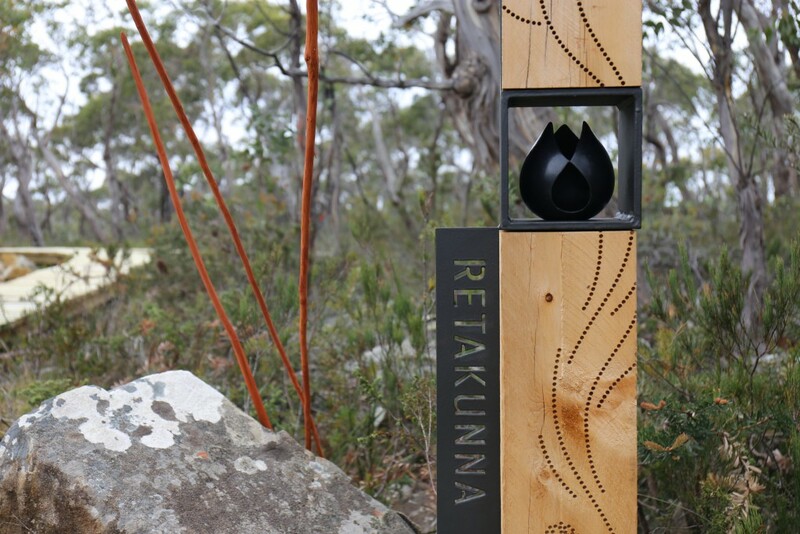 Retakunna – this inland site sits amongst eucalypt forest and woodland and is a quieter, more sheltered site. 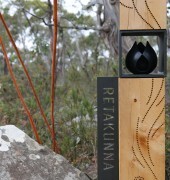 The work here focuses on fire and regeneration and references burning for land management and biodiversity. Fire symbolises the elemental force which is central to life and regeneration. 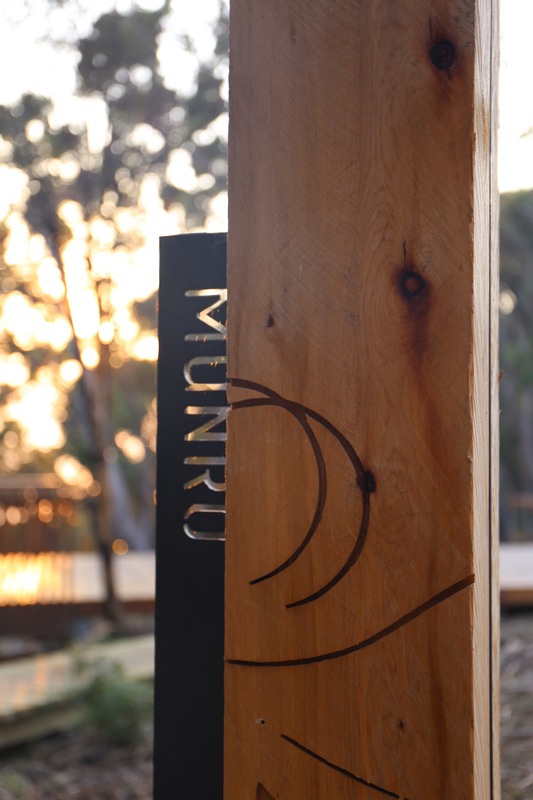 Fortescue Bay – this work is designed to create a sense of completion and is a place to gather, enjoy the views across Fortescue Bay and reflect on the experiences of the past four days. It includes a series of four oversize cast concrete abalone shells that sit amongst a cluster of locally sourced boulders and timber posts that are surface etched with patterns of sea kelp and she-oak. This series of public artworks are a extraordinary example of the integration of site specific art and design into wilderness locations and walking tracks. Due to its remote location the installation of the artworks was not straight forward with fabricated artwork components transported to the site by helicopter. 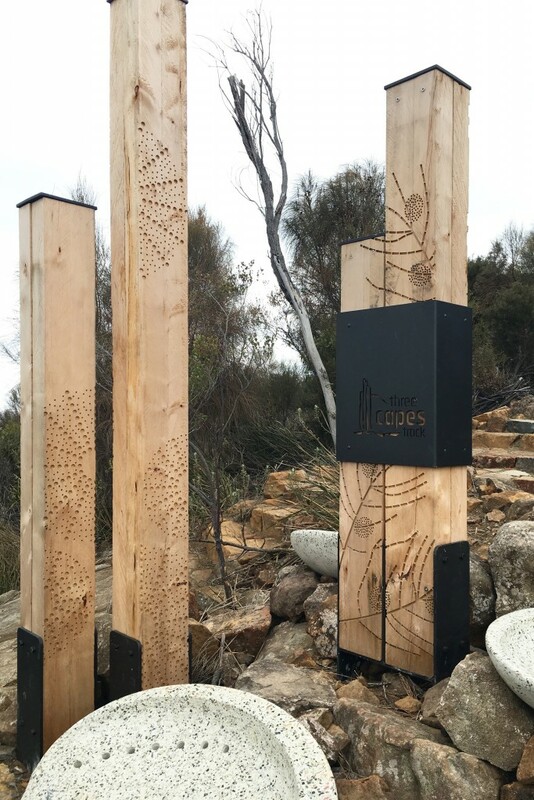 The artworks are an important and integral part of the track experience and provide an opportunity for walkers to have a deeper engagement and understanding of the area through the eyes of an artist. Alex Miles is a Tasmanian designer with 20 years experience in print, digital media and design for the built environment. 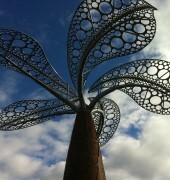 More recently her practice has extended to creative works for public spaces and private art commissions. 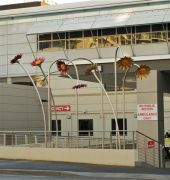 Other past projects include the design, development and realisation of: a large mural for the Smithton High School Gymnasium; a series of welcome panels and suspended mobile works for the Burnie Child and Family Centre; an installation of interactive children’s sculptures at Georgetown Child and Family Centre, a large sculptural bowl and spoon seating installation at Sorell Trade Training Centre, and a series of graphic glass panels for Wynyard High School. She is currently working on a large typographic screen installation for North Hobart Veterinary Hospital, a seating installation for the Tasman Trade Training Centre in Nubeena and another commission for the Department of Education’s Raminea Rd offices. Each involves consultation with various professionals (from architects and engineers to fabricators and builders) to determine the best materials, finishes and solutions for installation. Visit her website alexmiles.com.au for more information and contact details. Bookings essential. Visit the website for details.